Earlier this year I wrote about the big browser you haven’t heard of yet. Since then a lot has happened. Version 4.0 of Samsung Internet launched. 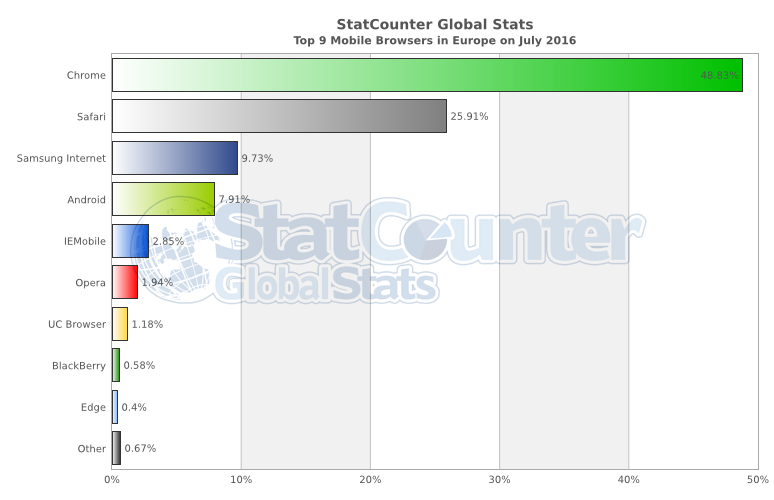 Almost simultaneously, StatCounter started collecting data on its use which has shown an almost 10% market share for Samsung Internet among all mobile browsing. I, along with other speakers, spoke on stage at Samsung’s Developer Conference about progressive web apps and Web&VR. HTML5test.com have started to list Samsung Internet as one of the major mobile browsers they are tracking. Samsung Internet is also listed on Jake Archibald’s “Is ServiceWorker ready yet” page? At Google’s Progressive Web App summit last month Jungkee Song and I presented on stage about progressive web apps. When other speakers highlighted browser support for progressive web app technologies, Samsung Internet was more often than not in the list. Samsung Internet is also now listed separately on Can I Use. Now, I’m exited to announce the launch of a new developer relations effort from Samsung Internet. We’re going to be blogging, writing code, speaking and participating at conferences and other events and generally getting the word out about advanced web features with a focus on Samsung Internet. We’re going to be writing here on Medium and other channels. We’re going to be contributing to open source projects that help mobile web developers with their work. We’re going to be writing and releasing code. Our goal will be to help developers build great web applications. This team is going to be physically based in the Samsung Research UK offices just outside London, and we’ll be ranging from there to events across Europe and the US. We’re also going to be acting as a feedback channel back to the Samsung Internet engineering team. If you’re writing a progressive web application, if you’re working with VR and the Web, if you’re interested in learning more about Samsung Internet, we want to talk to you. By Daniel Appelquist on July 25, 2016.